They say March comes in like a lion — and these websites have the strength to back that up! Come with us to see the power of the Kentico platform and the effectiveness of digital marketing in these amazing ten projects. Generac is an American manufacturer of backup power products and is the licensee of Honeywell-branded generators. The old site was outdated, so the objective of this project was to provide a smooth user journey with clear paths for individual user groups (for example, homeowners or contractors looking for backup generators) to access a mix of products targeted to their needs. Once the template development was completed, work began on an authenticated user account section of the site. The website leverages Kentico’s Content Staging for easy review, approval, and syncing of content across environments. To drive conversions further, Laughlin Constable utilized a real-time dealer location tool, powered by a Kentico API, and a power-needs calculator leveraging geolocation. The new site allows for streamlined content entry and targeted calls-to-action to increase conversions on key measures. 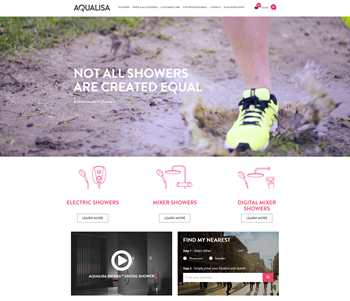 Aqualisa has pioneered the UK shower industry through the design, manufacture, and distribution of high-quality electric, digital, and mixer showers. Innovation, quality, and service is crucial for Aqualisa, leading to the creation of a website with top-notch user experience, improved e-commerce conversion rates, and reduced ongoing call centre costs. In the first month since its launch, the site has achieved an immediate 15% increase in conversion rates and a 51% increase in average basket value. The utilization of interactive tools helps customers choose and configure their perfect shower before directing them to their nearest showroom. The event booking system and the ordering process are quick and easy due to the fact that the site uses Kentico’s EMS and E-commerce functionality extensively. Custom interactive tools in addition to a Pinterest-style “inspiration board” help visitors choose an ideal shower. Digital Doughnut enables members of its community of over 1,000,000 marketers to share content, network, and find out about and register for events. The site extensively uses Kentico features like events, Forms, Roles, permissions, Blogs, and much more. Major Digital also used a combination of conditional layouts and page security within Kentico, which allowed content to be shown based on users’ login statuses. It was necessary to import clients’ data into Excel and write a custom script to import the relevant pages, user information, and data into relevant fields on the new site. This meant transferring 2,000 articles and importing over 18,000 users. The overall results are self-explanatory: a 22% increase in unique users and a 28% increase in sessions, a 42% increase in page views, as well as an 11% increase in pages per session, an 18% increase in average session duration, and a 12% decrease in bounce rate. Verdesian Life Sciences seeks to help row crop and specialty crop growers maximize their agricultural investments. There was a need to create an online experience that allowed Verdesian to integrate all of its websites and products into one site managed by one software platform. The main challenges were managing shared product data on the site (e.g., product listings, products search, etc. ), as well as documentation related to products and their hierarchical categories. Wirestream also needed to develop flexible content management — and quickly, as Verdesian and its product offerings continue to grow. Kentico’s Staging workflow made updates easier, as did a comprehensive document strategy, which aggregates relevant documentation to different product hierarchies. Since the site’s launch, year-on-year traffic is up by 140%, bounce rates have decreased by 19%, and time spent on the site is up by 42%. Belfast Waterfront is a major entertainment, conference, and meeting venue located in Belfast City Centre. The new website ensures that focus is placed on the conference market whilst retaining content relevant to the entertainment sector, including online ticketing. Appropriate user journeys were enabled for each user type, and user experience workshops were facilitated by i3 Digital. The website is integrated with back office admin systems to generate quality sales enquiries that convert to venue bookings and ticket sale. It is crucial that event and conference rooms are listed and utilise filters, and i3 Design used Kentico Widgets to add a newsletter subscription tool. The website’s design has adopted a cleaner, more modern, and exponentially more engaging look and feel than its predecessor and includes functionality and features absolutely crucial to Belfast City Council’s current and future requirements. Sponsored by The Textile Museum of Canada, Narrative Threads: Crafting the Canadian Quilt brings Canadian history to life through an interactive, online experience. It showcases textile, folk, and handicraft objects selected from both the museum’s permanent collections as well as contributors across Canada. The website is immersive for visitors — it is multilingual and incorporates a robust filter-by-categories system, custom embedded video widgets and image galleries, and a custom social sharing web part that encourages users to share their own artifacts on social media or submit their own photographs. Kentico’s extensive API and customization features as well as its intuitive content management features were integral to the completion of this project. Thanks to its beautiful, responsive user interface, Narrative Threads has been a hit since its launch. It’s a perfect example of what is possible with virtual learning. memoQ is a translation software developed by Hungarian company Kilgray Translation Technologies. Kilgray needed the new memoQ website to achieve bigger brand exposure, increase online sales, integrate a cloud service, and deliver rich site content. With the new site, Kilgray has seen many improvements between December 2014 and December 2015: a 12% increase in sales, an 8% increase in traffic, a 5-second increase in average visit duration, and a 10% decrease in the website’s bounce rates. The site utilizes various Kentico features: Marketing Automation, Email Marketing, a custom shopping cart, lead generation, an external license generator, a custom “my account” page, an external login, and integrations with Kayako, GoToWebinar, and a CRM. With this project, Emakina has created a site that is an all-in-one hub that connects all external systems and allows customers to have a central location for access. Building the website for the Santa Clarita Valley Birth Center was a multi-faceted challenge that Kentico was perfectly suited to handle. Firstly, the website needed to evoke a feeling of warmth and caring while also accurately reflecting the cleanliness and professionalism inherent in SCV Birth Center’s midwifery practice. Secondly, it also needed to be completed within the space of a single week without any heavy coding. Kentico allowed users with little to no coding experience to jump directly into the content creation process, making quick, apparent changes on the site. Kentico’s intuitive check-in and check-out system allowed for up to five content creators to cooperate efficiently without stepping on toes or duplicating work. The result is a striking website that conveys the beauty and safety of natural birth across an architecture that supports all the amenities of a modern site. WorkBC is the provincial government's access point to the world of work in British Columbia. It was created with one key goal—to help all British Columbians navigate B.C.’s labour market successfully. WorkBC helps people find jobs, explore career options, and improve their skills. It also helps employers fill jobs, find the right talent, and grow their businesses. Other people who regularly use WorkBC products and services include parents, teachers, career and employment counsellors, human resources professionals, researchers, and decision makers. WorkBC refreshed its information architecture and customer experience using Kentico. The admins have control over the site’s rich statistical data by creating custom interface modules that manage the content of hundreds of dynamically-created charts and graphs that appear in various pages site-wide. The focus of Metamark Genetics is comprehensive urological cancer care. It was necessary to update their digital presence to improve visitor interaction and patient education. The site needed to alleviate the issues of cumbersome content updates for staff members, utilize SEO best practices, and be developed responsively for mobile devices. iMedia’s was to build a unique environment that would allow Metamark to add and modify page content easily. Using Kentico, iMedia created custom Templates with editable regions, which allowed the client to add custom Widgets and content easily to the each page. Using Media Libraries, iMedia was able to organize media added to the site by the client, and Forms allowed Metamark to capture and control data from end users. A majority of the site was completed using Kentico’s built-in functions, providing an easy way to update front end code and create custom tables and pages types. Palmetto Health’s vision is clear: “Care to be remembered.” With the help of BlueKey and BlueSpire, Palmetto’s website is certainly one to remember. But don’t take our word for it, look at the numbers: an increase in online appointment request submissions by 1,800, a 208% quarter on quarter increase in overall page views, and a 33% increase in time spent on the site. Visit their page to see just how inspiring this month’s Customer Success Story really is! Palmetto Health is the largest and most comprehensive integrated health care system in the South Carolina Midlands region. The project, a collaborative solution by Blue Key and Blue Spire, utilized a variety of out-of-the-box Kentico components and custom modules to achieve a high level of interactivity and dynamic content, and Kentico’s easy-to-use management tools had to be used by both technical and non-technical staff. The result is a responsive site that provides visitors with access to a large network of hospitals, physicians, and medical services. It features a custom events calendar, a news and article application, a searchable directory with Google Maps integration and office locations, a complex pre-registration form with an encrypted database, and more. The custom modules were integrated with Kentico using the solution’s Web Part and Custom Table architecture. The total time to develop the site was 6 months. Hi! I work in Kentico as a Customer Insight Specialist and I am responsible for monthly evaluations of Top 10 Websites of the Month and also for a maintenance of case studies.